Could China Ever Govern Taiwan? China’s leaders, not used to dealing with public opinion, are unprepared to handle Taiwan’s vocal population. If there’s one thing that Chinese leaders have learned in the last decade and a half, it’s that dealing with democracies is never easy. In many ways, foreign politicians engaging with China have had an easy life. There were about a dozen people in the People’s Republic of China you had to work out, and then when you had major issues you tried to speak to them. Even now, when social media has made things a bit more complicated, you can largely assume that Beijing’s leaders are less prone to obsessing over public opinion than their western counterparts are. For Chinese politicians, they have to work out not only the politicians they are dealing with abroad, but also the vast ocean of forces in society around them. No wonder Beijing often gets it wrong. The politicians they are berating over certain issues simply don’t have the powers to do the things Chinese leaders think they can. In the past, this difference in dynamics of decision-making caused real problems. Former Premier Zhu Rongji went to the U.S. in late 1998 armed with what he felt was a watertight deal on World Trade Organization (WTO) entry. But President Clinton, with no support from Congress and battling public backlash over the Lewinsky affair, could no nothing. The rumor at the time was that Zhu was appalled by Clinton’s ineptitude, and the WTO deal had to languish for another three years. These days, Chinese leaders can see the issue of public opinion and its hold on politicians much closer up. For example, take the three Chief Executives appointed in Hong Kong since 1997 under the terms of the handover agreement with the UK. The first, Tung Chee Hwa, was overwhelmed by public opposition and had to leave office early. The second, Donald Tsang, left after a term and a half and reportedly no longer lives in the city. The third, C Y Leung, is proving to be so isolated and bereft of support that he might not even get to the end of his first term, let alone win a second one through a new arrangement for electing Chief Executives that is currently being discussed. Taiwan is even thornier. Heavy attempts at interference during Taiwan’s 1996 and 2000 presidential elections ended up with precisely the outcomes the PRC did not want. Eight years of Chen Shui-bian was punishment enough for Beijing. In 2008, then-President Hu Jintao’s legendary talent for silence served China well. The more palatable KMT won, and under President Ma Jing-jeou that party has largely delivered a much more stable cross-strait relationship. Until now, that is. The demonstrations in Taipei against the proposed Cross-Strait Service Trade Agreement do carry a number of important messages for us all to absorb. President Ma has obviously got a lot of work to do to convince a significant number of people in Taiwan that this deal isn’t a step too far. His statements during the demonstrations tried to spell out the benefits of the deal, but at the moment emotion is in control. And a fair number of Taiwanese feel threatened. Politicians have to do something about that. It is no use just nagging them. 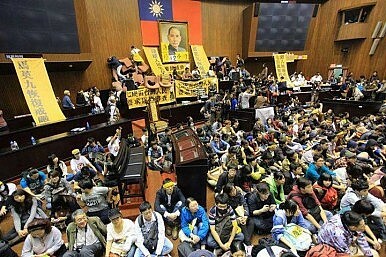 Some might interpret all the happenings in Taipei as the perfect time for Beijing to sit back smugly, nod its head, and say, “This is why democracies are so dysfunctional.” But if they did think that, I would suspect that chasing close behind such a thought would be a less comforting one. With all the vast governance issues within China at the moment—with a reform agenda that seems to grow steeper by the day, with truly nasty security incidents like the vicious Kunming Railway Station attack, and with growth starting to slow—why on earth would any government dealing with these issues want to take on a polity that is clearly as divided and complex as Taiwan’s (even in the highly unlikely event that reunification is feasible)? Xi Jinping and his colleagues are probably silently dusting off the Deng Xiaoping book of wisdom, one of the key points of which was to leave any settlement about Taiwan for the future—long into the future. The idea that in a post-modern era Beijing would want to, let alone be able to, handle the vast challenges of complex public opinion and expectation in Taiwan under its current strictures is hard to imagine. Can a Taiwanese Be The Delegate of China’s 19th Party Congress?